Prinsjesdag (English: Prince's Day) is the day on which the reigning monarch of the Netherlands (currently Queen Beatrix) addresses a joint session of the Dutch Senate and House of Representatives in the Ridderzaal or Hall of Knights in The Hague. The Speech from the Throne (Dutch: Troonrede) sets out the main features of government policy for the coming parliamentary session. 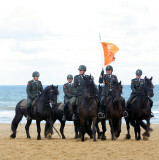 The day before Prinsjesdag the horses involved in the Royal riding tour undergo a training on the beach at Scheveningen in order to acquire stress resistance for their yearly performance.